Though the Revolutionary Snake Ensemble has been in existence since 1990, the group did not release its debut CD until 2003. Founder/saxophonist/flutist/composer Ken Field (Birdsong of The Mesozoic) views the RSE as an "improvisational percussion and horn group" greatly inspired by the music of New Orleans. Over the 2+ decades since its inception, RSE has many members including Boston-based improvisors Charlie Kohlhase, Russ Gershon (of the Either/Orchestra) and Dana Colley (Morphine). "Live Snakes" (Accurate Records) is RSE's 3rd CD and first since Field's wife, animator and filmmaker Karen Aqua passed (2011). For the most part, the program, 12 tracks from 4 different live gigs, stays true to Field's vision of "party music." All but one track features 2 drummers (either Kenny Wollesen, Joey Lefitz or Phil Neighbors) and most cuts feature 3 trombonists (some have 4, 2 have none). The irrepressible rhythms jumps from the speakers on pieces such as the opener "Parade" (one of the no 'bone tracks) where Fields' alto spars with the tenor sax of Matt Darriau while Wollesen and Neighbors push mightily. There is a similar feel to the funky take of "Que Sera Sera" - one can just see the musicians sashaying down Ramparts Street. The tenor saxes of Charles Neville and Tom Hall join the fray on the slinky version of the Tizol/Ellington classic "Caravan" which opens with a fine acoustic bass solo from Blake Newman and is enlivened by the roaring trumpet of Jerry Sabatini. "Rock of Ages"...well...it rocks while Fields' alto sax, Sabatini's trumpet and the twin trombones of Josh Roseman with Alex Asher have a polyphonic field day. The centerpiece of the CD is the fully improvised tribute to Ms. Aqua, "For Karen", recorded 8 days before her passing. The music begins slowly, quietly, the 4 trombonists and 1 trumpet moaning above the percussion. The alto sax begins to rise out of the dirge, the intensity picks up with Fields' intense melody line and then, slowly as it started, the piece fades. In an impressive job of mixing, the next track, "I'll Fly Away" (recorded 21 months later) serves as the second line returning from the cemetery. Fields and co-producer Andy Pinkham throw an interesting curve with the final 2 cuts, the electronics-laden remix of "Cassandra 4" and "Breakdown Part 1", the latter cut assembled from bits of bass lines, horn parts and rhythms of a number of cuts that are not on the recording. This creative "cutting-and-pasting" serves as a funky epilogue to the proceedings. Revolutionary Snake Ensemble finds joy in the rhythms of the street, in the melodies of the everyday, and in the shouts one creates against the darkness. 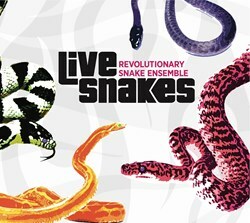 "Live Snakes" will get you out of your seat and out of many doldrums - give this music a whirl! For more information, go to www.revolutionarysnakeensemble.org. While some folks cry and moan at how jazz is marginalized, there are still great young musicians here in the US and around the world who are making impressive music. Take a close listen to "Oscillations", the self-released debut CD by bassist/composer Shane Cooper and take heart. The native of Port Elizabeth, East Cape Province, South Africa, the 29-year old Cooper started playing rock guitar with his brother before joining his high school band and becoming entranced by the bass and the rhythmic varieties of jazz, Even while attending the University of Cape Town (and since graduation), the bassist worked with numerous musicians including the master drummer Louis Moholo-Moholo. He works with groups such as Restless Natives, Babu and Closet Nature and is a member of pianist Kyle Shepherd's Trio. Cooper also has an electronic/hip hop project Cards on Spokes, with a debut 3-song ep that features the vocals of fellow South African Nicky Schrire. "Oscillations" features a quartet of impressive young musicians including Bokani Dyer (piano, Rhodes, organ), Kesivan Naidoo (drums, cymbals, cowbell), Reza Khota (electric guitar) and Justin Bellairs (alto saxophone) plus tenor saxophonist Buddy Wells (a veteran of the Cape Town scene) on 2 tracks. Produced by bassist/composer and mentor Carlo Mombelli, the generous recording (76+ minutes) covers a wide swath of musical territory, from the mysterious yet funky opener "Broken Blues" to the South African folk-inspired "The Herdsman" (the track opens with Cooper playing marovany, a box zither often heard the music of Madagascar) to the hard-bop burner "Oriah" (Wells and Bellair sharing the main theme) to the progressive rock feel of the title track. Cooper's compositions all have strong melodies; one could compare his composing style to that of Dave Holland and Mario Pavone, songs often built from the bottom up. Naidoo and Dyer, who have worked with the bassist for several years (in their own groups as well as his), are the perfect foils. They both play with great fire (the drummer may remind some of Jeff "Tain" Watts, especially on "Destination Unknown") and Dyer complements the bass with solid left hand work. His dancing opening fill on "Drop Down/Deconstruct" channels Monk while the melody line has a touch of Frank Zappa. Bellairs really digs into his solo, rising higher over the pulsing beat and the guitar counterpoint. Guitarist Khota, whose own impressive debut CD features both Cooper and saxophonist Wells, fires on all cylinders during his explosive solo on "Shadowplay" and, throughout the program, serves as counterpoint to Dyer's piano. Cooper rarely steps out to solo but, when he does, his powerful lines are, not surprisingly, quite melodic. Listening to "Oscillations" makes one realize the reach of creative music, that the work of John Coltrane, Miles Davis, Jason Moran, Greg Osby, Steve Coleman, Dave Holland and others continues to leap across boundaries of race, ethnicity and culture to inspire young musicians. Shane Cooper has created a masterful recording, with music that keeps one's interest and grows with each listen. And, it serves to introduce Bokani Dyer (whose 2011 CD "Emancipate The Story" is well worth exploring), Reza Khota, Justin Bellairs and the often brilliant work of Kesivan Naidoo to a wider audience. 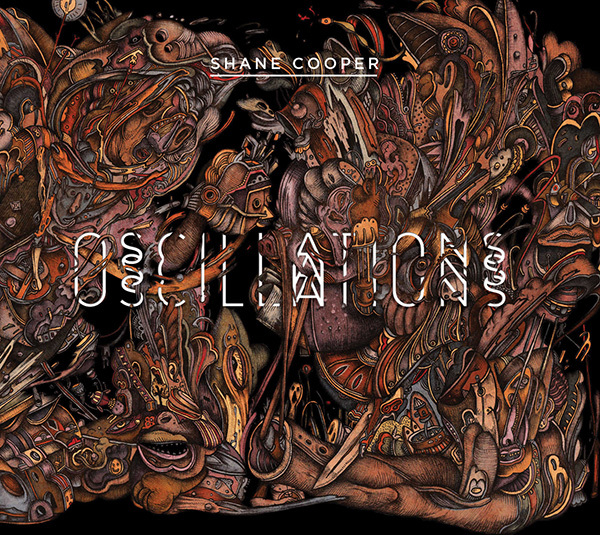 "Oscillations" deserves a rousing standing ovation - for more information, go to www.shanecoopermusic.com. Check out these artists in iTunes and at www.emusic.com. The cooperative collaboration of Jamie Saft (piano, organ), Steve Swallow (electric bass) and Bobby Previte (drums) have produced a fine new CD. "The New Standard" (RareNoiseRecords) is a most delicious collection of hour of music, an effort that blends jazz, soul, blues and rock influences into a finger-licking stew that satisfies on many levels. First, this music, recorded by Joe Ferla at Saft's home studio (Potterville International Sound), sounds so good. Swallow's bass is the foundation, his thick sound and big notes sustaining the pieces while one can hear all the nuances of Previte's playful drumming. Saft's acoustic piano fits easily into the mix, rising above the rhythm section or, on several occasions, climbing right in with them. There's an Eastern European feel to the melody and solo on Saft's "Trek" while "Minor Soul" gives off the Memphis vibe of the late Phineas Newborn Jr. and the very alive-and-lively Harold Mabern. "Clearing" is one of 3 tracks that feature Saft on the B-3 organ and is clearly influenced by the music of Robbie Robertson and the sound of Garth Hudson from The Band. "Blue Shuffle" takes the B-3 into the realm of Jimmy Smith with a touch of the gosplel. "All Things To All People" come at the listener like the classic Santana sound of the late 1960s, Previte's thunderous drumming and Swallow's throbbing bass underpinning Saft's swirling organ rifts. That track, along with "Clearing" and the bluesy "Step Lively" (which sounds influenced by Ben Tucker and Bob Dorough's "Comin' Home Baby"), is credited to all 3 musicians yet does not sound haphazard or unfocused. By the time the listener reaches the final track, "Surrender the Chaise" (great interaction between the Swallow's melodic bass lines and the deep bluesy piano melody), one realizes "The New Standard" is far from "standard" - it's a first-rate "labor of love." Recorded in one 3-hour session (! ), it's the result of years of working and playing together in various groups. "Playing" that sounds as much fun as this CD is combination of talent, trust, intuition, and joy. The music of Jamie Saft, Steve Swallow & Bobby Previte will make you shake your head and stomp your feet with joy; that's a mighty good reason to get up in the morning. For more information, go to www.rarenoiserecords. The music is available on CD, in various digital formats, and on a Double LP/180 grams vinyl. Thanks for your kind words, Richard, regarding my Revolutionary Snake Ensemble release!